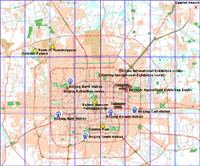 Beijing Map Forbidden City: Deshengmen West Main Street, Changping Road, Beicheng Road, Xianmen Main Street, Pinganlixi Main Street, Dianmen East Main Street, East Changan Street Crossing. Area Views: Olympic Park, Garden Square , Shuangxiu Park , Liuyin Park Western, Beihai Park , Zhongshan Park , Forbidden City , Municipal Government. Deshengmen West Main Street, Changping Road, Beicheng Road, Xianmen Main Street, Pinganlixi Main Street, Dianmen East Main Street, East Changan Street Crossing. Area Views: Olympic Park, Garden Square , Shuangxiu Park , Liuyin Park Western, Beihai Park , Zhongshan Park , Forbidden City , Municipal Government.